The new Fire Raid Rifts have been released since Wednesday 19th February 2014! You can purchase them from Rift Store -> Rifts (near the bottom) for the same price as the other Raid Rifts. This is a short-form guide for the new Fire Raid Rifts so everyone can quickly go out there and feel confident they know what they’re doing. Bloodfire Incursion Raid Rift can be summoned at a Raid Tear in the Steppes of Infinity zone. Kill adds. Click on the interactive doodads. Nothing really to worry about. Bloodfire Agitator’s “Velocity Strike” stuns the target for a few seconds. Can be interrupted. Random player will get an AoE called “Energy Bomb” from Bloodfire Agitators every now and then. Anyone inside the AoE when it goes off takes ~25% of Max HP. No real issue here other than if multiple players with Energy Bomb decide to run into the tank (tanks take ~20k damage). Bloodfire Exploders will explode in a very small AoE around them shortly after dying. Just go out of it. Does ~9-10k damage. Kill Vassal Sordu (15m hp). Kill 5x Bloodfire Exploders. Interrupt Fatal Dart. It does ~26k damage. Vassal spawns multiple Flame Wisps that move around the encounter. Anyone in its AoE will take ~8-9k ticks. Vassal does “Flame Leash” ability. This pulls all Flame Wisps into him. Anyone in melee will see their hp disappear. “Heat Shield” gives him a 6-sec shield. Purge it. “Vitality” is a cast that gives him ~500-600k hp. Interrupt it. For this boss you could choose to dps the Flame Wisps; but it’s probably better to just have everyone ranged – or melee just go in, pewpew a bit, then go out before he does Flame Leash. Interrupt Fatal Dart and Vitality. You’ll either need two tanks for this, or have someone kite one of them. Pull them far apart from each other, otherwise they gain a +100% damage buff. “Blast Off” – AoE knockback. Approx 25-30m range. ~10k damage. “Time Bomb” – Places in the entire raid after a knockback. Must run into the Bloodfire Rager to remove it. Otherwise take ~19k damage after the timer ticks down. “Rage Punch” – Small Conal attack. Easily dodged. Approx 21k damage. “Rage Unleashed” – AoE melee attack he does after Blast Off and sometimes whilst Time Bomb is still ticking – so you run into him to remove Time Bomb then run out to not get hit by Rage Unleashed. ~10k damage. Keep them apart. Either use 2 tanks, or have one person kite the other one (make sure to have a healer on them due to the AoE abilities and Time Bomb). Don’t be in-between the two otherwise you’ll likely end up getting hit by two Time Bombs and two Blast Offs/etc. There’s no enrage mechanic for killing one before the other – or any HP differential mechanic so just concentrate on one first then do the other. “Heat Burst” is a very narrow but long conal attack. Avoid it. Does ~53k dmg. “Focused Energies” – She puts out multiple moving AoEs. Avoid them as they tick for ~8k dmg. “Planar Repulsor”. An emote will go up “A Planar Repulsor has appeared. Lure Legate Gan Atoras to it!” – The Planar Repulsor does significant damage to the boss. Adds also appear – tank tanks them. “Fiery Rage”. She adds stacks of a buff that increases her outgoing damage. You can purge these. “Flash Flare” – Yellow 145% or so cleave. Avoid it; Looks to be a % attack because normal players were getting hit for 20-25k damage whilst tanks were getting hit for 40-60k damage. This is also affected by “Fiery Rage” of course. “Incubating”. Channel on a Fire Egg that spawns into a Blazing Thrall. Blazing Thrall: These guys deal damage via “Lava Burst” and “Magma Stone” mainly. Interruptible. However, their Magma Stone adds a debuff called “Scorched Bones” that increases damage received on the target. Ten stacks triggers Scorched Flesh which deals 17-18k damage to the raid.Scorched Flesh is usually what kills people during this fight (other than “Red Flame, Blue”) because if the stacks don’t drop off, the Blazing Thralls will keep refreshing to 10 stacks on the target and you’ll get multiple Scorched Flesh 17-18k damage on the raid in a short order. “Cold Fire Chain”. Tether on a random player. A laser that goes from the player to a small blue circle on the ground. Run over that circle to get rid of the Tether. Cold Fire Chain deals ~5-6k damage per tick until you get rid of it. “Red Flame, Blue”. This mechanic adds a huge Red AoE and a huge Blue AoE to the encounter. Everyone gets either a Red arrow or a Blue arrow above their heads. Move to the AoE that matches your color before his cast ends. You’ll have to repeat this a few times – sometimes your color will alternate, other times it will remain the same – pay attention. “Grip of Fire” – he’ll target someone and use Grip of Fire which does a % of your max hp. Normal player get hit for ~9k per tick; tanks get hit for approx 30k per tick. Does 3 ticks. So basically – If you have a blue laser on you, run to the blue circle. Either kill Blazing Thrall or have somebody manage them. Interrupting can help. Using two tanks will help out. Have one tank hold threat on all the Blazing Thrall adds and the other to tank the boss. Then switch when the tank that is holding threat on the Blazing Thralls has 5-6 stacks of Scorched Bones. Make sure it doesn’t hit 10. Having people interrupt each Blazing Thrall’s “Magma Stone” also helps reduce the speed of Scorched Bones stacks increasing. When a large Red and large Blue AoE spawns, check above your head for your color and run to the same color AoE. Wait for his cast to stop, then if he casts another “Red Flame, Blue”, check above your head again and go to the correct colored AoE that matches the colored arrow above your head. Lure opened in The Dendrome. Listen to Ambassador Indelik. Just a roleplay. Make sure you go near him and he starts talking or else the adds won’t spawn. “Velocity Strike” from Bloodfire Agitators (the casters) will stun their target (usually the tank). You can interrupt this although not doing so usually isn’t fatal (unless the tank loses aggro whilst stunned). Kill the two Fire Heralds. Enrage mechanic – When one dies, the other one enrages and does more damage. “Blue Fire” – AoE knockback; ~19-21k damage. Also adds a debuff called “Sizzle” to those who are knocked back. It’s a DOT that does ~5k per tick. Targets a random player. Spread out. An enraged Fire Herald will deal ~30k per Blue Fire. “Ember Summons” – summons a group of adds. Nothing important. Interruptible. Spread out as the Blue Fires are aimed at random players and does AoE knockback around that player. “Lava Link” – Placed on the whole raid. It’s a red laser between you and the boss. Tick damage increases over time. Does ~2.7-3k per tick for the first two ticks; then ~4.5k per tick for the next two and so on and so forth. Removed by running into the boss. “Rock Punch” – Attacks tank for ~24k dmg. “Lava Spray” – Spews a ball of lava that drops as a yellow AoE. Does approx 8k per tick. “Magma Trap” – Magron will emote “Magron glares at player”. That player (random) ends up getting trapped in a Magma Trap. Has 1.3M dps and during that time that player cannot use any abilities. DPS them out. Does 5k ticks dmg to the trapped person. Simple – just stack on the boss. This will nullify “Lava Link” mechanic and those in Magma Trap end up breaking out through passive AoE on the Boss. If a vital healer gets trapped in Magma Trap, you may want to ST the Magma Trap down instead of relying on passive AoE. Adds spawn. Supposed to give the boss a buff if the adds die within 10m of him, but doesn’t seem like that’s working. “Scorched Earth”. Vias will emote “Vias begins casting Scorched Earth. Seek shelter in the Sanctuary.” Find the Green AoE platform that spawns on the ground (has a large flag in the middle, can’t miss it) and make sure you are inside the Green AoE by the time his cast finishes or you take 100,000 damage. “Heat Exhaustion” – placed on random players. Decreases movement speed, healing and dps by 50%. Cleanse it. Crystals. There’s 3 types of crystals that Charknight Gotahl spawns. One gives him a buff that damages players around Charknight. Another continuously adds outgoing damage buff stacks to the boss. And another keeps summoning adds. Cleanse Heat Exhaustion. Depending on your DPS/Heals, you can simply ignore crystals and adds and just burn the boss. Kill Ambassador Indelik. Very interesting fight. “Heat Blast”. The boss only has one major ability. Heat Blasts damages players and knocks them back. The damage is forgettable, but the knockback has an issue with Sanctuary. Ghosts of all the other bosses will spawn. They cannot be targeted, but they’ll use one of their abilities throughout the fight. You’ll see yellow AoEs, Scorched Earth (stay in green AoE/Sanctuary), attacks from the Ghost of Fire Heralds, Sizzle cleanses/etc. “Healing Glow”. A small yellow wisp will spawn near the outside ring of the encounter and head towards the boss. Destroy it or else it’ll start healing the boss. Unfortunately since you can’t target the Ghost of Land Scorcher Vias – it may be hard to see when Scorched Earth completes. Run to Sanctuary (Green AoE). Stay on it, even if Yellow AoE spawns. Leave only when Sanctuary despawns. 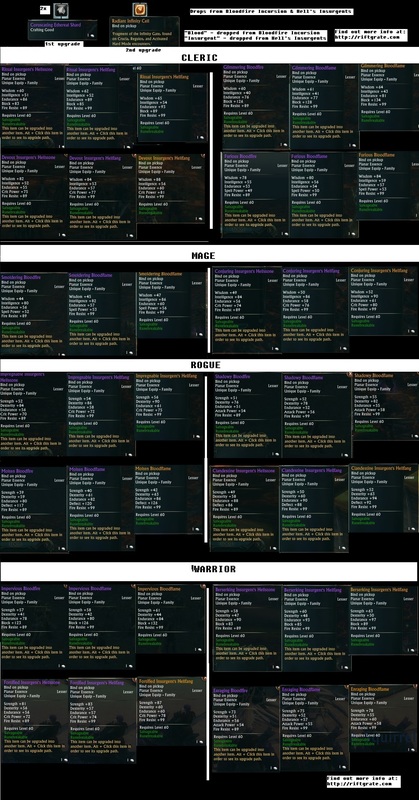 Here’s the full list of Lesser Essence drops from the new Raid Rifts. Where they drop are self-explanatory – ‘insurgents’ drop from Hell’s Insurgents, ‘blood’ drop from Bloodfire Incursion.